11. 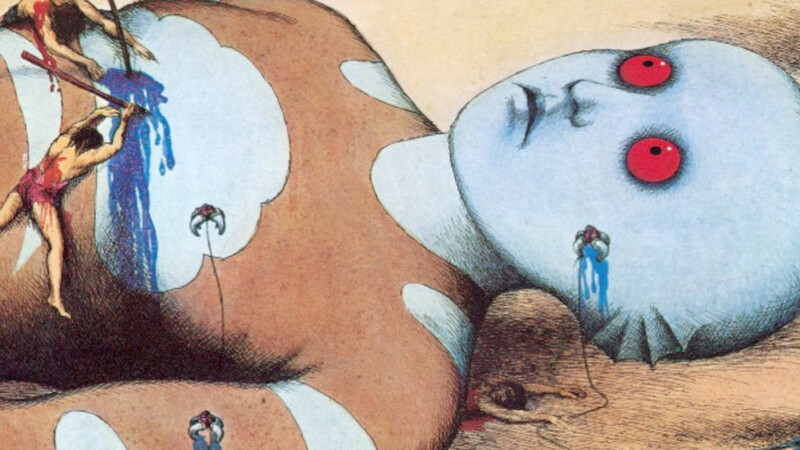 Fantastic Planet (1973). Dir. by Rene Laloux. France/Czechoslovakia. No list can be complete without this haunting classic, whether sci-fi, cult, or animation. Here it belongs because it is a stop-motion film. The technique was used to bring the fantastic cutouts to life. This film tells the story of human-like Oms living on the planet of humanoid (though a hundred times larger and more technologically advanced) Draags, who keep some Oms as pets, but treat the rest as pests. The tale of their confrontation is the plot, but it’s superseded by, well, fantastic imagery of that surreal world. The noted French artist Roland Topor co-wrote and designed the film. It is sometimes easy to forget that this is stop-motion works, so seamless and smooth is the movement of characters. Other works: Rene Laloux directed a lesser-known classic, Time Masters (1982), designed by Moebius. See also two Laloux/Topor shorts, The Dead Times (1964) and Snails (1965). 12. 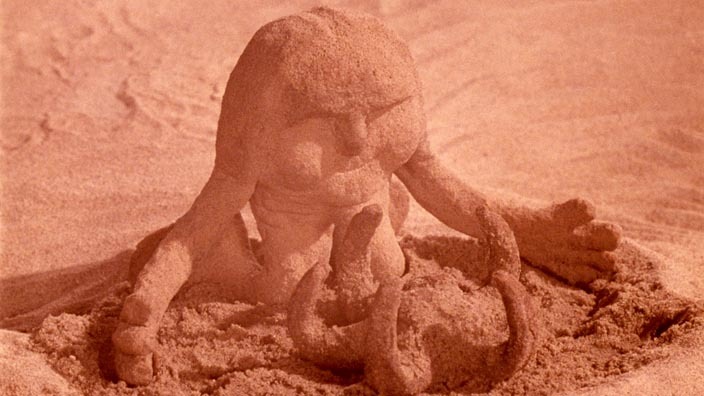 The Sand Castle (1977). Dir. by Co Hoedeman. Canada. This Oscar-winning short is a quirky celebration of sand and teamwork. Strange creatures made of rubber and sand-covered foam gather together to build a castle of sand. Whimsical and philosophical at the same time. 13. The Little Prince (1979). Dir. by Will Vinton. USA. Before it became Laika, the famed Portland claymation studio was named for its founder and creative force, Will Vinton. He was able to take claymation to a completely new level, with his inventive and spirited works. This is the best possible adaptation of Antoine Saint-Exupery’s immortal classic. The malleable nature of claymation is perfectly suited for quick transitions of the worlds. The figures of Prince and Fox are charming, and the Snake is menacingly oscillating. Other works: a treasure-trove for claymation lovers. Beginning with the first, Oscar-winning Closed Mondays (1974), to Martin the Cobbler (1977), Rip van Winkle (1978), another Oscar-winner The Great Cognito (1982), and the feature The Adventures of Mark Twain (1985). And let’s not forget those California Raisins! 14. The Tale of Tales (1979). Dir. by Yuri Norshteyn. USSR. This one routinely tops the lists of best animated films ever made. Here stop-motion is just one of the techniques used. Norshteyn takes a paper cut-out and animates it against an incredibly deep background of multiple layers of glass. This 30 minute short can be classified as stream of memory-using a little wolf from a Russian lullaby, Norshteyn brings the world of childhood dreams and impressions to life. The artistry is stunning and the experience is indelible. Other works: Norshteyn’s entire filmography clocks in at slightly over an hour. Utilizing the same technique, he made a couple of others not to be missed: The Heron and the Crane (1974), and, especially, The Hedgehog in the Fog (1975), the latter being an influence on artists as varied as Hiyao Miyazaki, Michel Gondry, and Bjork. 15. 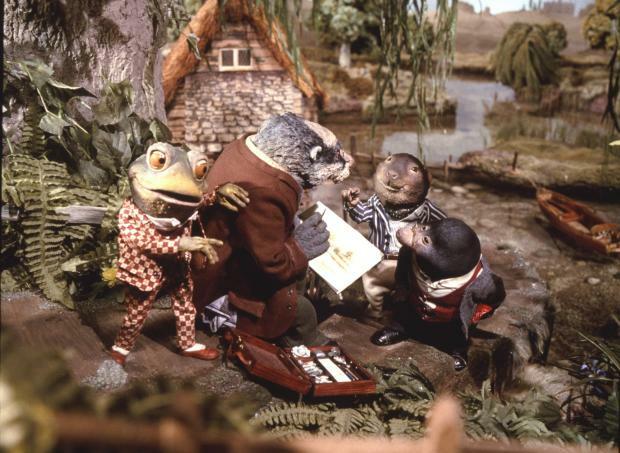 The Wind in the Willows (1983). Dir. by Mark Hall and Chris Taylor. UK. This puppet adaptation of Kenneth Grahame’s enduring children’s classic stands out as probably the best of them all. The quirkiness associated with puppet animation lends itself well to show the shenanigans of Mr. Toad and his friends. 16. Cabaret (1984). Dir. by Ideya Garanina. USSR. Puppetry at its best. Unfortunately, ran afoul of Soviet authorities, for reasons known only to them. Definitely not for children. It’s a masterful adaptation of several Lorca plays that captures his spirit and lyricism. What begins as a travelling Punch and Judy show, with evil mother-in-law being banished to hell and hilarious buffo infidelities ensuing, abruptly switches gears mid-film and enters a lyrical and soulful domain of human heart. Towards the end, one forgets about puppets and sees real people. Other works: too few, but they’re worth checking out. The Crane Feathers (1977) captures the spirit of Japanese mythology. Poor Liza (1983) is another heartfelt ode. 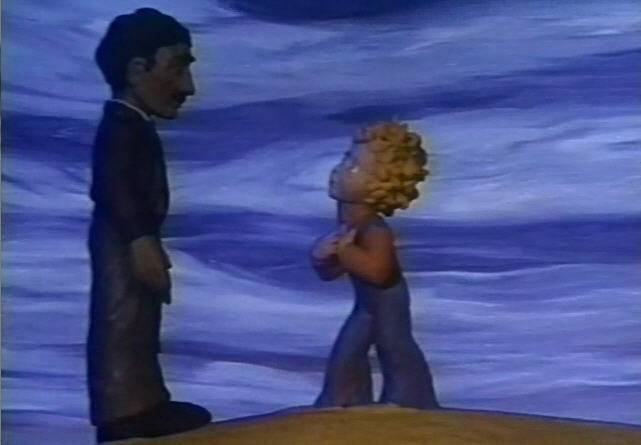 The Cat That Walked by Himself (1988) is a humorous and positive claymation adaptation of Kipling’s just-so story. 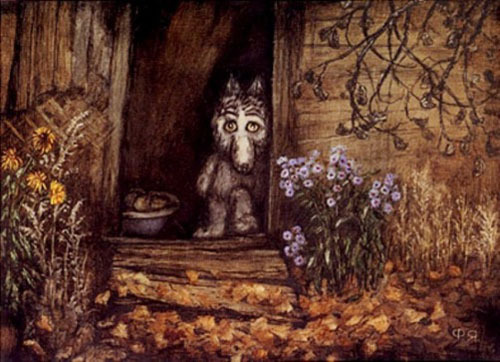 Garanina has proven that stop-motion can be ideally suited for literary adaptations. 17. 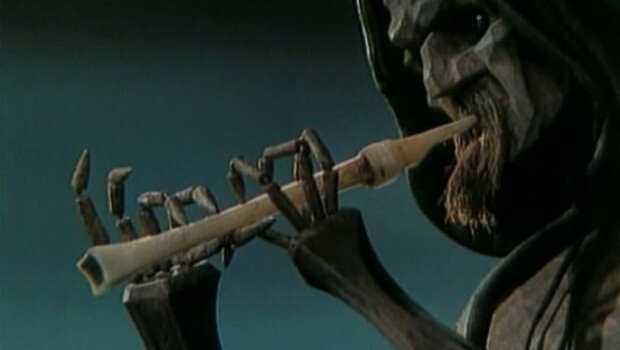 The Pied Piper of Hamelin (1985). Dir. by Jiri Barta. Czechoslovakia. A strikingly-cut puppet adaptation of Browning’s famous poem. Not just the inhabitants, but the town of Hamelin itself is hewn out of wood, recalling German expressionism and cubism. Dialogue here is replaced with strange noises. And, it packs a very surprising twist in the end. Other works: Barta made several striking shorts. The Club of the Laid Off (1989) brings cracked and broken mannequins to life. The Vanished World of Gloves (1982) takes us through the history of cinema as performed by the gloves. 18. Door/Dream/Alter Ego (1986/1988/1989). Dir. by Nina Shorina. USSR. Perestroika was generally good for Soviet artists, including animators. Whether prior an artist like Nina Shorina could only make her puppet films for children, now she could address more serious themes. This informal trilogy is her best work. The most accessible of them is Door (1986), which shows inhabitants of the building using creative ways to enter and exit the building with a stuck front entrance. A humorous and satirical allegory. Dream (1988) is a somnambulist short about dreams taking over reality and rendering protagonists inactive. Alter Ego (1989) is a surreal collage of puppets, actors, masks, and inanimate object, to reach deep into the artist’s soul. Other works: of children’s films, the best is Poodle (1985). 19. The Big Underground Ball (1987). Dir. by Stanislav Sokolov. USSR. A 20 minute masterpiece with no dialogue necessary. A King of the Forest gathers elves, sprites, and other assorted woodland spirits for a night of festivities. The spirits frolic, dance, drink, and romance. Conflicts arise and are resolved. The puppetry here is top-notch, and the rear-projections of fire and water add an extra depth to the magical world. A trip to a mysterious and happy world. Other works: Sokolov has brought his unique puppets to screen since the 70’s. Of major shorts: Dogada (1977), Black and White Movie (1985). Recently, made a feature based on the tales of E.T.A. Hoffman. 20. Alice (1988). Dir. by Jan Svankmajer. Czechoslovakia. 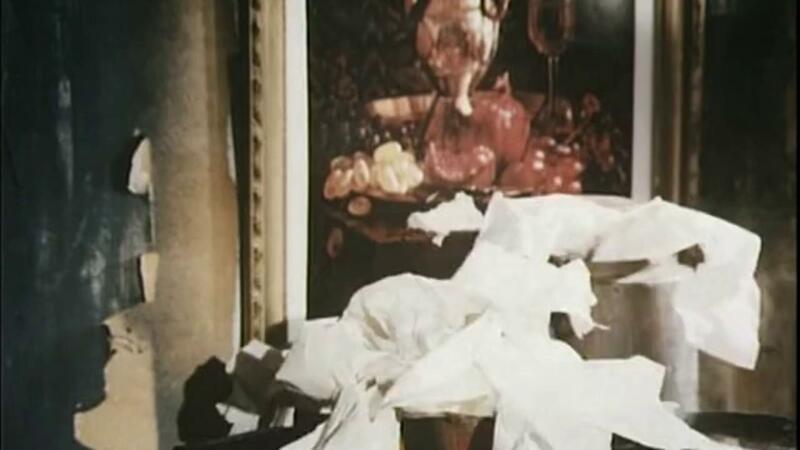 At least a dozen of other works by Svankmajer could have easily made this list. He is the greatest surrealist east of Dali. For over half a century, he has been influencing other artists with his unique and strange works. This one, his first feature, is an unforgettable adaptation of Lewis Carroll’s “Alice in Wonderland”. Featuring a real child actress as Alice (well, for large parts of the film, as she undergoes several transformations), Svankmajer creates a phantasmagoric and often scary Wonderland, full of strange and aggressive puppets, rusty nails, collapsible walls, and other kunstkamer oddities. Watch out, Alice. Other works: welcome to a world like no other. For features, see Faust (1994), Conspirators of Pleasure (1996), Little Otik (2000), Lunacy (2005). The best of his diverse and crazy shorts are A Game with Stones (1965), Punch and Judy (1966), Jabberwocky (1971), Dimensions of Dialogue (1982), The Pendulum, the Pit, and the Hope (1983), The Death of Stalinism in Bohemia (1990), Food (1992).